Happy Holidays to all Hawaii Craftsmen members and supporters! Our year has been full of shows and activities. We are thankful to our part-time staff and many volunteers who have made our programs a success. Aha Hana Lima, Raku Ho'olaulea, our Annual juried show. As members of Hawaii Craftsmen you are part of a fifty year tradition of making crafts and the art of crafts accessible to many through our public programs. Our programs help to "fertilize" and "grow" our local talent. Next year will be our 50th year anniversary and we look forward to celebrating with you our members and our community. As 2016 approaches and we close out this holiday season, I reflect on the great year Hawaii Craftsmen just completed. We started making initial plans for our 50th Anniversary starting in 2016 and extending into 2017. In March a great set of Aha Hana Lima workshops were followed by another outstanding Raku campout and summer exhibit. Our Second Saturday event in September was a great success for the families attending. We installed a new process for our Annual Statewide Juried Exhibit that ultimately made our October Annual Exhibit easier to plan and execute and gained us new artists and new recognition. In the coming year we have exciting programs for you. 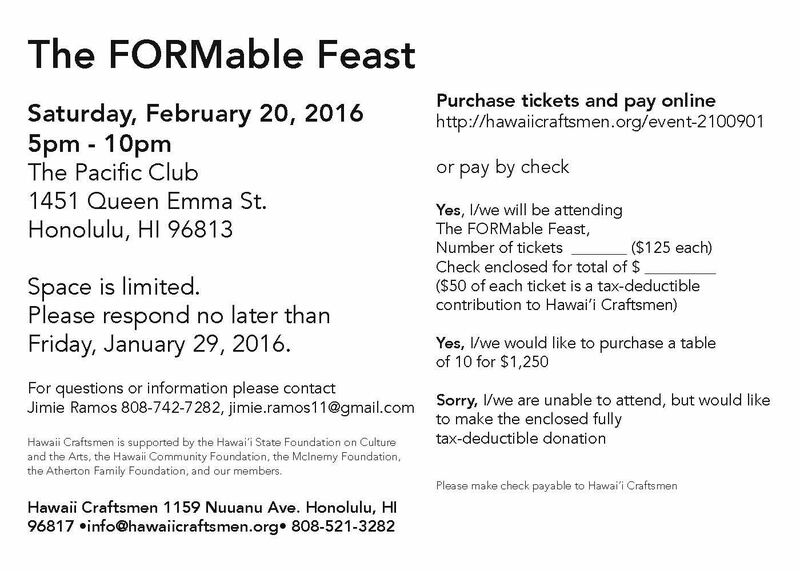 First of those is a special fundraising event: our Formable Feast dinner, February 20, 2016 at the Pacific Club, Honolulu. 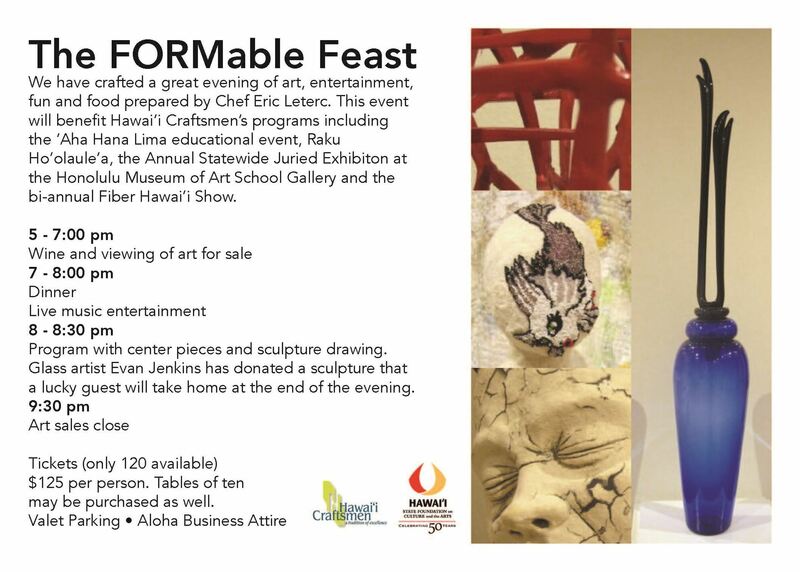 You can sell your artwork on a 50% commission or donate 100% to keep Hawaii Craftsmen financially healthy. Then later in May, after our Aha workshops, we'll celebrate our 40th anniversary of Raku Ho'olaulea! Also, next year we host another Fiber Hawaii Exhibit, set to open in mid-August followed by another fabulous ASJE in October. Please join us in volunteering for these outstanding programs. Best to you all this Holiday season! As chair of the 2015 Annual Statewide Juried Exhibition, I would like to express my deepest gratitude to all the volunteers who dedicated their time and hard work to make this year’s program a great success. Visitors to the exhibition commented on the beauty of the installation, designed by Jackie Mild Lau with assistance from Chris Edwards. This year’s juror, Dr. Lowery Stokes Sims, received the highest praise for selection of the 90 diverse and high-quality artworks chosen from 264 entries. Invited artists, Joey Chiarello, Sharon Doughtie, and Michael Mortara, presented 9 exquisite artworks shown with juried selections. The Hawaiʻi Craftsmen board was able to offer 16 awards, including 8 new perpetual awards sponsored by the Peter Drewliner Trust. Winners were presented awards on opening night and images of the artworks are featured on our website homepage. Congratulations are due to exhibiting artists Francisco Clemente, Shigeru Miyamota, Michael Mortara, and Chris Edwards, whose entries were selected for acquisition by the Honolulu Museum of Art and the Hawaiʻi State Art Museum. Ten entries by member artists Chris Edwards, Johanette Rowley, Barbara Thompson, Mark White, and Taryn Yamane were sold to private collectors. We used the CaFÉ system, a computerized entry and cataloguing system which allowed the juror to preview works in advance of traveling to Hawaiʻi. She was able to gain a greater understanding of the scope and diversity of art work from the islands and makerepresentative selection from the entries. CaFÉ provided an effective management system for the complex and time-consuming tasks associated with organizing exhibit. Exhibition chairs were able to prepare in advance for intake and jurying. Member artists registered for the 2015 annual exhibition via CaFÉ. The system now allows them to easily search local, state, regional, and national calls for juried visual art competitions, museum exhibitions, public art projects, fellowships, and artist-in-residencies. As an artist’s tool, CaFÉ enables artists to manage an inventory of images and information about their artwork, while providing automated alerts for new calls and upcoming deadlines. Via CAFÉ, Hawaiʻi Craftsmen and its members now have the opportunity to integrate their artwork into a larger national market; to increase their opportunities for display and sales; and to promote the fine crafts of Hawaiʻi across the nation. Use of CaFÉ attracted many new, emerging, and young artists to our organization. This trend was mirrored in the juror’s selection of entries with almost half created by young and emerging artists, including 6 awards winners. As we begin the New Year plans for the 49th Annual Statewide Juried Exhibition are underway. I look forward to working with the board, members, and volunteers in our continued efforts to refine and improve this important program. Kim Coffee-Isaak is a glass artist and former board member and was the first Executive Director for Hawaii Craftsmen. She is currently working with the board as a grant writer and fund developer. December 2015….I’ve had a wonderful time reconnecting with Hawaii Craftsmen and it’s members and am looking forward to securing abundant financial resources to help us celebrate our anniversary year. Writing funding proposals allows me to focus and articulate the positive impact that Hawaii Craftsmen has had on the crafts community for many years. We all should be proud to have played a part in keeping fine craft a relevant and enriching part of Hawaii’s island communities. The results of the short survey we sent in May tell us the organization is valued and appreciated by many of our members. Many spoke of diversity, professionalism and quality art/craft as well as a sense of community, inspiration and motivation to make more and better work. Several comments about national exposure and economic impact because of participation in HC programs were especially nice to receive. I’d also like to take the time to thank those who have supported us this past year: Hawaii State Foundation on Culture and the Arts, Hawaii Community Foundation-Flex Grant, McInerny Foundation, Atherton Family Foundation, Cooke Foundation and the John Wythe White and Victoria Gail-White Left Wing Right Brain Fund. These grants support, in part, our general operations and basic programs. We also received generous support, almost $8,000, for our exhibition awards from many in our community: Judy Pyle & Wayne Pitluck, Timothy Y. C. Choy Fund of HCF, Violet Loo, Peter Drewliner Trust, Pegge Hopper Galleries and The Charles E. Higa Award. It is fantastic to be an organization that can provide cash support to celebrate the great work to our members. Mahalo nui loa to the HC Board members for helping me do my job well. And Mahalo to all the Hawaii Craftsmen makers who inspire us to work harder to support the work you do. Jean Williams, Past President 1997- 1998. Jean has recently volunteered to edit the newsletter. She has her own business and marketing consulting business, has taught classes directed to artists and craftspeople and once consulted with the Department of Business and Economic Development on the first statewide program for artists, craftspeople and fashion designers. Please send articles or ideas for articles to her at newsletter@hawaiicraftsmen.org. I operate a glass facility that has evolved this year into Glass Arts Association of Hawaii. You can learn about us online at www.glassartshawaii.org. We are having our first visiting artist workshops this week and offer classes and experiences for people worldwide! Hope to keep you in the loop with what's going on at our facility. Next month we have Blowing Hot Air, an introduction glass blowing course on Saturdays with Richard Duggan and Scott Osborn. I am also teaching two courses through Outreach College at our facility, both 10 weeks long. The Fire to Water course is our popular 5000 years of history course. Liquid to Solid is a solid sculpture course. 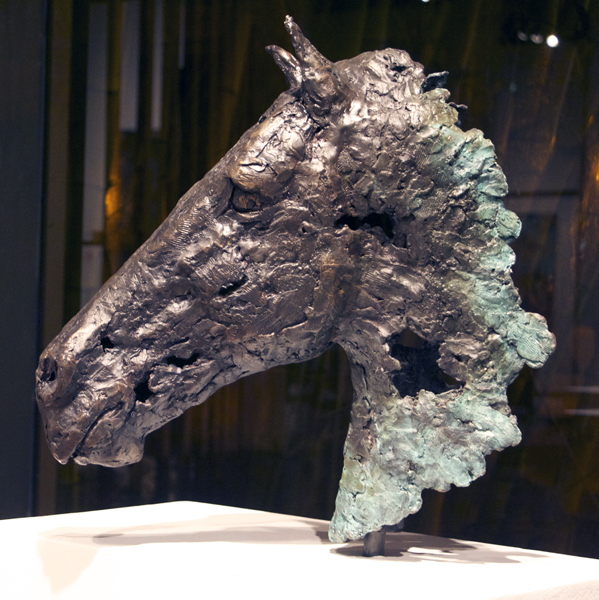 Referring to her recent works in Honoring Totems: Giving Presence of Form Erin states, “These sculptures are depictions of the mares’ emergence from the obscurity of my dreams. In the process of sculpting them they become whole, separating themselves from my memory. Their emergence from the ground they are set in thereby gives them presence outside my dreams. They each arrive as messengers, bringing knowledge, and guidance. Every visit, no matter how brief, is important to me.” Erin expects to receive her BFA degree from the Department of Art + Art History, UHM, in 2015. For more information, please visit theUH Department of Art and Art History website. The Hawaii State Foundation on Culture and the Arts is seeking volunteers for Acquisition Award Selection Committee Visual Arts Consultants to participate in the art selection process for acquisitions by the SFCA. For more information and an application form, please visit their website, sfca.hawaii.gov. We'd like your help! The board members and committee chairs take the leadership role in planning activities, and they need committee members who can meet regularly and help them with the details of their projects. • Raku – selling tea bowls, t-shirts, silent auction, etc. • Follow up press releases with phone calls and personal meetings.